2004-11-22 Assigned to ADVANCED CARDIOVASCULAR SYSTEMS, INC. reassignment ADVANCED CARDIOVASCULAR SYSTEMS, INC. ASSIGNMENT OF ASSIGNORS INTEREST (SEE DOCUMENT FOR DETAILS). Assignors: PACETTI, STEPHEN D.
2010-12-03 First worldwide family litigation filed litigation Critical https://patents.darts-ip.com/?family=35501179&utm_source=google_patent&utm_medium=platform_link&utm_campaign=public_patent_search&patent=US20060047095(A1) "Global patent litigation dataset” by Darts-ip is licensed under a Creative Commons Attribution 4.0 International License. A polymer of fluorinated monomers and hydrophilic monomers is provided. It is also provided a polymer blend that contains a polymer of fluorinated monomers and another biocompatible polymer. The polymer of fluorinated monomers or polymer blend described herein and optionally a bioactive agent can form a coating on an implantable device such as a drug-delivery stent. The implantable device can be used for treating or preventing a disorder such as atherosclerosis, thrombosis, restenosis, hemorrhage, vascular dissection or perforation, vascular aneurysm, vulnerable plaque, chronic total occlusion, patent foramen ovale, claudication, anastomotic proliferation for vein and artificial grafts, bile duct obstruction, ureter obstruction, tumor obstruction, or combinations thereof. The nature of the coating polymers plays an important role in defining the surface properties of a coating. For example, a very low Tg, amorphous coating material can have unacceptable rheological behavior upon mechanical perturbation such as crimping, balloon expansion, etc. On the other hand, a high Tg, or highly crystalline coating material introduces brittle fracture in the high strain areas of the stent pattern. A current paradigm in biomaterials is the control of protein adsorption on the implant surface. Uncontrolled protein adsorption, leading to mixed layer of partially denatured proteins, is a hallmark of current biomaterials when implanted. Such a surface presents different cell binding sites from adsorbed plasma proteins such as fibrogen and immunogloblulin G. Platelets and inflammatory cells such as monocyte/macrophages and neutrophils adhere to these surfaces. Unfavorable events can be controlled by the use of non-fouling surfaces. These are materials, which absorb little or no protein, primarily due to their hydrophilic surface properties. Some of the currently used polymeric materials such as poly(vinylidene-co-hexafluoropropene) have good mechanical properties, and acceptable biocompatibility, but also have low permeability to drugs. One proposed solution to ameliorate this issue is to blend in hydrophilic polymers. However, it is well known in the art that many hydrophilic materials such as polyethylene oxide or hyaluronic acid are water-soluble and can be leached out of the composition such that the coating may lose biobeneficiality. Such polymeric blends can also have compromised mechanical properties, particularly the ultimate elongation. Provided herein is a polymer formed of fluorinated monomers and hydrophilic monomers. The fluorinated monomers can provide mechanical strength and/or flexibility, biocompatibility, and physiologic durablity for the polymer. The hydrophilic monomers impart drug permeability to the polymer, and can provide additional biobeneficial properties. where m and n can be 0 or positive integers ranging from, e.g., 1 to 100,000 and m+n≠0; and o can be a positive integer ranging from, e.g., 1 to 100,000. 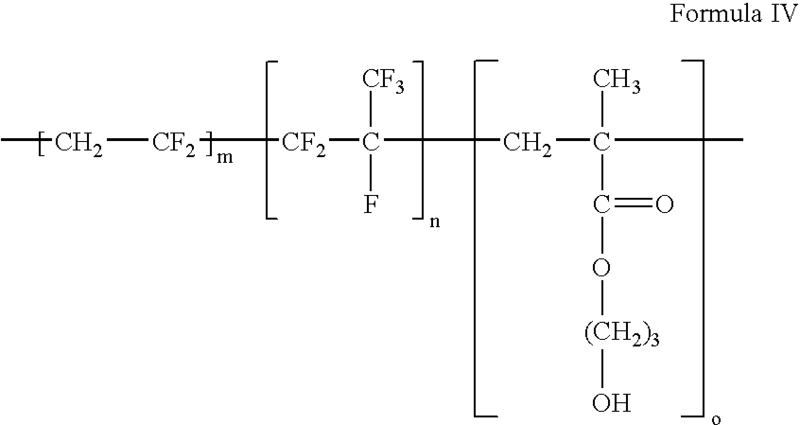 The strength fluoro monomers are generally fluorinated ethylene monomers such as —CF2—CF2—, —CH2—CF2—, —CH2—CHF—, —CF2—CHF—, —CHF—CHF—, or CF2—CRF— where R can be phenyl, cyclic alkyl, heterocyclic, heteroaryl, fluorinated phenyl, fluorinated cyclic alkyl, or fluorinated heterocyclic. 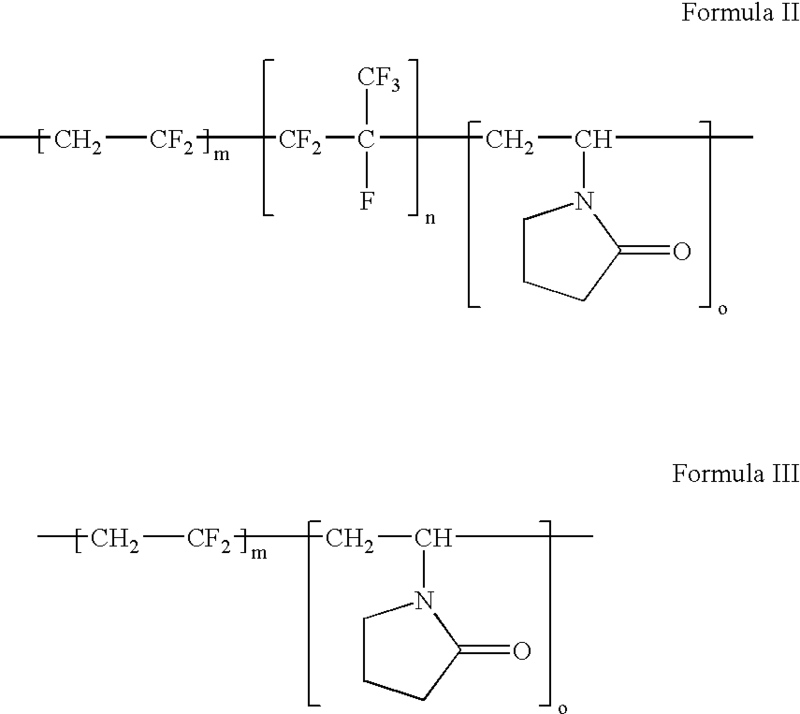 The flexibility fluoro monomers are generally substituted fluorinated ethylene monomers bearing a substituent (R), —CF2—CRF—, —CHF—CRF—, and —CF2—CRH—. R can be trifluoromethyl, F, Cl, Br, I, short chain alkyl groups from C2 to C12, fluorinated short chain alkyl groups from C2 to C12, and combinations thereof. The hydrophilic monomers can be any vinyl monomer having pyrrolidone group(s), carboxylic acid group(s), sulfone group(s), sulfonic acid group(s), amino group(s), alkoxy group(s), amide group(s), ester group(s), acetate group(s), poly(ethylene glycol) group(s), poly(propylene glycol) groups, poly(tetramethylene glycol) groups, poly(alkylene oxide), hydroxyl group(s), or a substituent that bears a charge and/or any of pyrrolidone group(s), carboxylic acid group(s), sulfone group(s), sulfonic acid group(s), amino group(s), alkoxy group(s), amide group(s), ester group(s), acetate group(s), poly(ethylene glycol) group(s), poly(propylene glycol) group(s), poly(tetramethylene glycol) group(s), poly(alkylene oxide) group(s), and hydroxyl group(s). Some exemplary hydrophilic monomers are vinyl pyrrolidone, hydroxyethyl methacrylate, hydroxypropyl methacrylate, methyl vinyl ether, alkyl vinyl ether, vinyl alcohol, methacrylic acid, acrylic acid, acrylamide, N-alkyl acrylamide, hydroxypropylmethacrylamide, vinyl acetate, 2-sulfoethyl methacrylate, 3-sulfopropyl acrylate, 3-sulfopropyl methacrylate, and PEG-methacrylate. Some exemplary substituents bearing a charge can be, for example, choline, phosphoryl choline, 2-aminoethyl methacrylate hydrochloride, N-(3-aminopropyl)methacrylamide hydrochloride, 2-N-morpholinoethyl methacrylate, vinylbenzoic acid, vinyl sulfonic acid, and styrene sulfonates. The monomers for strength generally account for about 60 mole % to about 90 mole % of the total monomers forming the polymer, the monomers for flexibility generally account for about 0 mole % to about 40 mole % of the total monomers forming the polymer, and the hydrophilic monomers for enhancing permeability generally account for about 0 mole % to about 20 mole % of the total monomers forming the polymer. By varying the mole percentages of the three components of the polymer, one can fine-tune physical properties of the polymer. The polymer or polymer blends described herein can be used to form a coating(s) on an implantable device. The polymers or polymer blends described herein can also be used to form the implantable device itself. The implantable device can optionally include a bioactive agent. Some exemplary bioactive agents are paclitaxel, docetaxel, estradiol, nitric oxide donors, super oxide dismutases, super oxide dismutases mimics, 4-amino-2,2,6,6-tetramethylpiperidine- 1 -oxyl(4-amino-TEMPO), tacrolimus, dexamethasone, rapamycin, rapamycin derivatives, 40-O-(2-hydroxy)ethyl-rapamycin (everolimus), 40-O-(3-hydroxy)propyl-rapamycin, 40-O-[2-(2-hydroxy)ethoxy]ethyl-rapamycin, and 40-O-tetrazole-rapamycin, ABT-578, clobetasol, prodrugs thereof, co-drugs thereof, and combinations thereof. The implantable device can be implanted in a patient to treat or prevent a disorder such as atherosclerosis, thrombosis, restenosis, hemorrhage, vascular dissection or perforation, vascular aneurysm, vulnerable plaque, chronic total occlusion, claudicationanastomotic proliferation for vein and artificial grafts, bile duct obstruction, ureter obstruction, tumor obstruction, or combinations thereof. where m and n can be 0 or positive integers ranging from, e.g., 1 to 100,000 and m+n≠0; and o can be a positive integer ranging from, e.g., 1 to 100,000. The strength fluoro monomer can be in the range of, e.g., from about 60 mole % to about 90 mole %, the flexibility fluoro monomer can be in the range of, e.g., from about 0 mole % to about 40 mole %, and the hydrophilic monomer can be in the range from above 0 mole % to about 20 mole %. The hydrophilic monomers can be any vinyl monomer having pyrrolidone group(s), carboxylic acid group(s), sulfone group(s), sulfonic acid group(s), amino group(s), alkoxy group(s), amide group(s), ester group(s), acetate group(s), poly(ethylene glycol) group(s), poly(propylene glycol) group(s), poly(tetramethylene glycol) group(s), poly(alkylene oxide) group(s), hydroxyl group(s), or a substituent that bears a charge and/or any of pyrrolidone group(s), carboxylic acid group(s), sulfone group(s), sulfonic acid group(s), amino group(s), alkoxy group(s), amide group(s), ester group(s), acetate group(s), poly(ethylene glycol) group(s), poly(propylene glycol) group(s), poly(tetramethylene glycol) group(s), poly(alkylene oxide) group(s), and hydroxyl group(s). Some exemplary hydrophilic monomers are vinyl pyrrolidone, hydroxyethyl methacrylate, hydroxypropyl methacrylate, methyl vinyl ether, alkyl vinyl ether, vinyl alcohol, methacrylic acid, acrylic acid, acrylamide, N-alkyl acrylamide, hydroxypropylmethacrylamide, vinyl acetate, 2-sulfoethyl methacrylate, 3-sulfopropyl acrylate, 3-sulfopropyl methacrylate, and PEG-methacrylate. Some exemplary substituents bearing a charge can be, for example, choline, phosphoryl choline, 2-aminoethyl methacrylate hydrochloride, N-(3-aminopropyl)methacrylamide hydrochloride, 2-N-morpholinoethyl methacrylate, vinylbenzoic acid, vinyl sulfonic acid, and styrene sulfonates. The vinyl pyrrolidone is known to be miscible with the vinylidene fluoride as both have strong dipolar interactions. Therefore, there is not a large driving force for phase separation. The vinylidene fluoride has a propensity to crystallize and, therefore provides the strength for the polymer. This strength can be tuned by the amount of hexafluoropropene, which lowers the crystallinity and promotes the flexibility of the polymer. The pyrrolidone is a hydrophilic monomer and will increase the water absorption of the polymer. Water absorption of the polymer strongly influences the drug permeability of the polymer. For example, poly(vinylidene fluoride-co-hexafluoropropene) has a very low water absorption of <0.04 w %, and it has a low drug permeability. Addition of small amounts of vinyl pyrrolidone in the range between about 1 mole % to about 10 mole % will appreciably alter drug permeability of the polymer. In formula III, the pyrrolidone would inhibit the crystallization of the vinylidene fluoride monomers, which will increase the flexibility of the polymer. The pyrrolidone group would also impart hydrophilicity to the polymer, thereby increasing drug permeability of the polymer. In this polymer, the tetrafluoroethylene monomer imparts strength to the polymer, and the hexafluoropropene monomer provides flexibility to the polymer. The hydrophilicity of the polymer can be tuned by the amount of 3-hydroxypropyl methacrylate. In addition, with an adequate amount of 3-hydroxypropyl methacrylate, in the range of 5-25 mole %, incorporated in to a terpolymer with 5-15 mole % hexafluoropropene, this polymer can be made solvent soluble. The polymers described herein can be synthesized by methods known in the art (see, for example, D. Braun, et al., Polymer Synthesis: Theory and Practice. Fundamentals, Methods, Experiments. 3rd Ed., Springer, 2001; Hans R. Kricheldorf, Handbook of Polymer Synthesis, Marcel Dekker Inc., 1992; G. Odian, Principles of Polymerization, 3rd ed. John Wiley & Sons, 1991). For example, one method that can be used to make the polymer can be free radical methods (see, for example, D. Braun, et al., Polymer Synthesis: Theory and Practice. Fundamentals, Methods, Experiments. 3rd Ed., Springer, 2001; Hans R. Kricheldorf, Handbook of Polymer Synthesis, Marcel Dekker Inc., 1992). Polymerization by suspension or emulsion techniques utilizing free radical initiation is commonly employed. Block copolymers and terpolymers can be produced by atom transfer polymerization. Grafting of hydrophilic monomers onto pre-made poly(vinylidene fluoride-co-hexafluoropropylene) can be accomplished by ozonation of the fluoropolymer followed by thermally induced graft polymerization of the hydrophilic monomer. Polymerization in solvent can also be used to synthesize the polymers described herein. In another embodiment, a hydrophobic polymer of fluorinated monomers such as polyvinylidene fluoride (PDVF) or poly(vinylidene fluoride-co-hexafluoropropylene) (PVDF-co-HFP) can be blended with one or more additional biocompatible polymers having different hydrophilicity and/or flexibility to generate a polymer blend coating material that has desired flexibility and drug permeability. Generally, useful polymers that can be blended with the polymer of fluorinated monomers are substantially miscible with the polymer of fluorinated monomers. In a further embodiment, any of the polymers of formulae I-IV can be blended with one or more additional biocompatible polymer, which is described below. The additional biocompatible polymer can be biodegradable (both bioerodable or bioabsorbable) or nondegradable, and can be hydrophilic or hydrophobic. Hydrophilic is defined to have a δ value greater than about 8.5, e.g., a δ value of about 8.5, about 9.5, about 10.5 or about 11.5. Representative biocompatible polymers include, but are not limited to, poly(ester amide), polyhydroxyalkanoates (PHA), poly(3-hydroxyalkanoates) such as poly(3-hydroxypropanoate), poly(3-hydroxybutyrate), poly(3-hydroxyvalerate), poly(3-hydroxyhexanoate), poly(3-hydroxyheptanoate) and poly(3-hydroxyoctanoate), poly(4-hydroxyalkanaote) such as poly(4-hydroxybutyrate), poly(4-hydroxyvalerate), poly(4-hydroxyhexanote), poly(4-hydroxyheptanoate), poly(4-hydroxyoctanoate) and copolymers including any of the 3-hydroxyalkanoate or 4-hydroxyalkanoate monomers described herein or blends thereof, poly polyesters, poly(D,L-lactide), poly(L-lactide), polyglycolide, poly(D,L-lactide-co-glycolide), poly(L-lactide-co-glycolide), polycaprolactone, poly(lactide-co-caprolactone), poly(glycolide-co-caprolactone), poly(dioxanone), poly(ortho esters), poly(anhydrides), poly(tyrosine carbonates) and derivatives thereof, poly(tyrosine ester) and derivatives thereof, poly(imino carbonates), poly(glycolic acid-co-trimethylene carbonate), polyphosphoester, polyphosphoester urethane, poly(amino acids), polycyanoacrylates, poly(trimethylene carbonate), poly(iminocarbonate), polyurethanes, polyphosphazenes, silicones, polyesters, polyolefins, polyisobutylene and ethylene-alphaolefin copolymers, acrylic polymers and copolymers, vinyl halide polymers and copolymers, such as polyvinyl chloride, polyvinyl ethers, such as polyvinyl methyl ether, polyvinylidene halides, such as polyvinylidene chloride, polyacrylonitrile, polyvinyl ketones, polyvinyl aromatics, such as polystyrene, polyvinyl esters, such as polyvinyl acetate, copolymers of vinyl monomers with each other and olefins, such as ethylene-methyl methacrylate copolymers, acrylonitrile-styrene copolymers, ABS resins, and ethylene-vinyl acetate copolymers, polyamides, such as Nylon 66 and polycaprolactam, alkyd resins, polycarbonates, polyoxymethylenes, polyimides, polyethers, poly(glyceryl sebacate), poly(propylene fumarate), poly(n-butyl methacrylate), poly(sec-butyl methacrylate), poly(isobutyl methacrylate), poly(tert-butyl methacrylate), poly(n-propyl methacrylate), poly(isopropyl methacrylate), poly(ethyl methacrylate), poly(methyl methacrylate), epoxy resins, polyurethanes, rayon, rayon-triacetate, cellulose acetate, cellulose butyrate, cellulose acetate butyrate, cellophane, cellulose nitrate, cellulose propionate, cellulose ethers, carboxymethyl cellulose, polyethers such as poly(ethylene glycol) (PEG), copoly(ether-esters) (e.g. PEO/PLA); polyalkylene oxides such as poly(ethylene oxide), poly(propylene oxide), poly(ether ester), polyalkylene oxalates, polyphosphazenes, phosphoryl choline, choline, poly(aspirin), polymers and co-polymers of hydroxyl bearing monomers such as HEMA, hydroxypropyl methacrylate (HPMA), hydroxypropylmethacrylamide, PEG acrylate (PEGA), PEG methacrylate, 2-methacryloyloxyethylphosphorylcholine (MPC) and n-vinyl pyrrolidone (VP), carboxylic acid bearing monomers such as methacrylic acid (MA), acrylic acid (AA), alkoxymethacrylate, alkoxyacrylate, and 3-trimethylsilylpropyl methacrylate (TMSPMA), poly(styrene-isoprene-styrene)-PEG (SIS-PEG), polystyrene-PEG, polyisobutylene-PEG, polycaprolactone-PEG (PCL-PEG), PLA-PEG, poly(methyl methacrylate)-PEG (PMMA-PEG), polydimethylsiloxane-co-PEG (PDMS-PEG), poly(vinylidene fluoride)-PEG (PVDF-PEG), PLURONIC™ surfactants (polypropylene oxide-co-polyethylene glycol), poly(tetramethylene glycol), hydroxy functional poly(vinyl pyrrolidone), biomolecules such as collagen, chitosan, alginate, fibrin, fibrinogen, cellulose, starch, collagen, dextran, dextrin, fragments and derivatives of hyaluronic acid, heparin, fragments and derivatives of heparin, glycosamino glycan (GAG), GAG derivatives, polysaccharide, elastin, chitosan, alginate, and combinations thereof. In some embodiments, the polymer can exclude any one of the aforementioned polymers. The copolymer of fluorinated monomers and hydrophilic monomers can form a coating optionally with a biobeneficial material. The combination can be mixed, blended, or coated in separate layers. The biobeneficial material useful in the coatings described herein can be a polymeric material or non-polymeric material. The biobeneficial material is preferably non-toxic, non-antigenic and non-immunogenic. A biobeneficial material is one which enhances the biocompatibility of a device by being non-fouling, hemocompatible, actively non-thrombogenic, or anti-inflammatory, all without depending on the release of a pharmaceutically active agent. Representative biobeneficial materials include, but are not limited to, polyethers such as poly(ethylene glycol), copoly(ether-esters) (e.g. PEO/PLA); polyalkylene oxides such as poly(ethylene oxide), poly(propylene oxide), poly(ether ester), polyalkylene oxalates, polyphosphazenes, phosphoryl choline, choline, poly(aspirin), polymers and co-polymers of hydroxyl bearing monomers such as hydroxyethyl methacrylate (HEMA), hydroxypropyl methacrylate (HPMA), hydroxypropylmethacrylamide, poly (ethylene glycol) acrylate (PEGA), PEG methacrylate, 2-methacryloyloxyethylphosphorylcholine (MPC) and n-vinyl pyrrolidone (VP), carboxylic acid bearing monomers such as methacrylic acid (MA), acrylic acid (AA), alkoxymethacrylate, alkoxyacrylate, and 3-trimethylsilylpropyl methacrylate (TMSPMA), poly(styrene-isoprene-styrene)-PEG (SIS-PEG), polystyrene-PEG, polyisobutylene-PEG, polycaprolactone-PEG (PCL-PEG), PLA-PEG, poly(methyl methacrylate)-PEG (PMMA-PEG), polydimethylsiloxane-co-PEG (PDMS-PEG), poly(vinylidene fluoride)-PEG (PVDF-PEG), PLURONIC™ surfactants (polypropylene oxide-co-polyethylene glycol), poly(tetramethylene glycol), hydroxy functional poly(vinyl pyrrolidone), biomolecules such as fibrin, fibrinogen, cellulose, starch, collagen, dextran, dextrin, hyaluronic acid, fragments and derivatives of hyaluronic acid, heparin, fragments and derivatives of heparin, glycosamino glycan (GAG), GAG derivatives, polysaccharide, elastin, chitosan, alginate, silicones, PolyActive™, and combinations thereof. In some embodiments, the coating can exclude any one of the aforementioned polymers. The polymeric coatings or the polymeric substrate described herein may optionally include one or more bioactive agents. These bioactive agents can be any agent which is a therapeutic, prophylactic, or diagnostic agent. These agents can have anti-proliferative or anti-inflammatory properties or can have other properties such as antineoplastic, antiplatelet, anti-coagulant, anti-fibrin, antithrombonic, antimitotic, antibiotic, antiallergic, antioxidant as well as cystostatic agents. Examples of suitable therapeutic and prophylactic agents include synthetic inorganic and organic compounds, proteins and peptides, polysaccharides and other sugars, lipids, and DNA and RNA nucleic acid sequences having therapeutic, prophylactic or diagnostic activities. Nucleic acid sequences include genes, antisense molecules which bind to complementary DNA to inhibit transcription, and ribozymes. Some other examples of other bioactive agents include antibodies, receptor ligands, enzymes, adhesion peptides, blood clotting factors, inhibitors or clot dissolving agents such as streptokinase and tissue plasminogen activator, antigens for immunization, hormones and growth factors, oligonucleotides such as antisense oligonucleotides and ribozymes and retroviral vectors for use in gene therapy. Examples of anti-proliferative agents include rapamycin and its functional or structural derivatives, 40-O-(2-hydroxy)ethyl-rapamycin (everolimus), and its functional or structural derivatives, paclitaxel and its functional and structural derivatives. Examples of rapamycin derivatives include methyl rapamycin (ABT-578), 40-O-(3-hydroxy)propyl-rapamycin, 40-O-[2-(2-hydroxy)ethoxy]ethyl-rapamycin, and 40-O-tetrazole-rapamycin. Examples of paclitaxel derivatives include docetaxel. Examples of antineoplastics and/or antimitotics include methotrexate, azathioprine, vincristine, vinblastine, fluorouracil, doxorubicin hydrochloride (e.g. Adriamycin® from Pharmacia & Upjohn, Peapack N.J.), and mitomycin (e.g. Mutamycin® from Bristol-Myers Squibb Co., Stamford, Conn.). Examples of such antiplatelets, anticoagulants, antifibrin, and antithrombins include sodium heparin, low molecular weight heparins, heparinoids, hirudin, argatroban, forskolin, vapiprost, prostacyclin and prostacyclin analogues, dextran, D-phe-pro-arg-chloromethylketone (synthetic antithrombin), dipyridamole, glycoprotein IIb/IIIa platelet membrane receptor antagonist antibody, recombinant hirudin, thrombin inhibitors such as Angiomax a (Biogen, Inc., Cambridge, Mass. ), calcium channel blockers (such as nifedipine), colchicine, fibroblast growth factor (FGF) antagonists, fish oil (omega 3-fatty acid), histamine antagonists, lovastatin (an inhibitor of HMG-CoA reductase, a cholesterol lowering drug, brand name Mevacore from Merck & Co., Inc., Whitehouse Station, N.J.), monoclonal antibodies (such as those specific for Platelet-Derived Growth Factor (PDGF) receptors), nitroprusside, phosphodiesterase inhibitors, prostaglandin inhibitors, suramin, serotonin blockers, steroids, thioprotease inhibitors, triazolopyrimidine (a PDGF antagonist), nitric oxide or nitric oxide donors, super oxide dismutases, super oxide dismutase mimetic, 4-amino-2,2,6,6-tetramethylpiperidine-1-oxyl (4-amino-TEMPO), estradiol, anticancer agents, dietary supplements such as various vitamins, and a combination thereof. Examples of anti-inflammatory agents including steroidal and non-steroidal anti-inflammatory agents include tacrolimus, dexamethasone, clobetasol, combinations thereof. Examples of such cytostatic substance include angiopeptin, angiotensin converting enzyme inhibitors such as captopril (e.g. Capoten® and Capozide® from Bristol-Myers Squibb Co., Stamford, Conn.), cilazapril or lisinopril (e.g. Prinivil® and Prinzide® from Merck & Co., Inc., Whitehouse Station, N.J.). An example of an antiallergic agent is permirolast potassium. Other therapeutic substances or agents which may be appropriate include alpha-interferon, bioactive RGD, and genetically engineered epithelial cells. The foregoing substances can also be used in the form of prodrugs or co-drugs thereof. The foregoing substances are listed by way of example and are not meant to be limiting. Other active agents which are currently available or that may be developed in the future are equally applicable. In accordance with embodiments of the invention, a coating of the various described embodiments can be formed on an implantable device or prosthesis, e.g., a stent. For coatings including one or more active agents, the agent will retain on the medical device such as a stent during delivery and expansion of the device, and released at a desired rate and for a predetermined duration of time at the site of implantation. Preferably, the medical device is a stent. A stent having the above-described coating is useful for a variety of medical procedures, including, by way of example, treatment of obstructions caused by tumors in bile ducts, esophagus, trachea/bronchi and other biological passageways. A stent having the above-described coating is particularly useful for treating occluded regions of blood vessels caused by abnormal or inappropriate migration and proliferation of smooth muscle cells, thrombosis, and restenosis. Stents may be placed in a wide array of blood vessels, both arteries and veins. Representative examples of sites include the iliac, renal, and coronary arteries. A 20 gallon glass lined autoclave is filled with 11 gallons of deionized water, and then sparged with nitrogen to remove oxygen. The autoclaved is then charged with 3.47 kg of vinylidene fluoride (VDF) and 1.53 Kg of hexafluoropropylene (HFP). 40 g of a 70% solution of tertiary butyl hydroperoxide in water is diluted to 250 ml with deionized water. 31 g of sodium metabisulfite and 6.3 g of ferrous sulfate heptahydrate is diluted to 250 ml with deionized water. These two solutions are added separately to the autoclave over a ten period time period. The autoclave is maintained throughout the entire polymerization between 15-25° C. After 30 minutes into the polymerization, vinyl pyrrolidone is pumped into the autoclave. After consumption of the initial charge of VDF and HFP, VDF and HFP are added to the autoclave at the stoichiometric ratio to maintain a reactor pressure of 50-130 psig. In total, 25 kg of VDF, 11 kg of HFP, and 2.7 kg of vinyl pyrrolidone is added to the autoclave. After consumption of all monomers, the autoclave is vented, and the water removed. The polymer is purified by extracting twice with 20 liters of methanol followed by drying in vacuo. To a 2.5 gallon stainless steel autoclave equipped with agitation is added copper bromide (28g, 0.195 mole), 2,2′-bipyridine (60.9 g, 0.39 mole), and 1,2-diiodoethane (55 g, 0.195 mole). The autoclave is purged with argon to remove all oxygen. CO2 is introduced to reach a pressure of 1200 psig and the autoclave thermostated to ambient temperature. The autoclave is then charged with 1 kg of VDF and 528 g of HFP. The temperature is raised to 40° C. and the reaction allowed to proceed for 20 hours. Vinyl pyrrolidone is added (43.4 g) and the polymerization allowed to proceed for 11 more hours. After venting the autoclave the polymer is dissolved in 5 liters of acetone and then isolated by precipitation into methanol. A polymer solution containing between about 0.1 mass % and about 15 mass %, for example, about 2.0 mass % of PBMA and the balance, a solvent mixture of acetone and cyclohexanone, the solvent mixture containing about 60 mass % of acetone and about 40 mass % of xylene is prepared. The solution is applied onto a stent to form a primer layer. To apply the primer layer, a spray apparatus, such as an EFD 780S spray nozzle with a VALVEMATE 7040 control system (manufactured by EFD, Inc. of East Providence, R.I.) can be used. The EFD 780S spray nozzle is an air-assisted external mixing atomizer. The composition is atomized by air and applied to the stent surfaces. During the process of applying the composition, the stent can be optionally rotated about its longitudinal axis, at a speed of 50 to about 150 rpm. The stent can also be linearly moved along the same axis during the application. The poly(butyl methacrylate) (PBMA) solution can be applied to a 1 2-mm small VISION stent (available from Guidant Corporation) in a series of 10-second passes, to deposit, for example, 10 μg of coating per spray pass. Between the spray passes, the stent is dried for about 10 seconds using flowing air with a temperature of about 60° C. Five spray passes can be applied, followed by baking the primer layer at about 80° C. for about 1 hour. As a result, a primer layer can be formed having a solids content of about 50 pg. “Solids” means the amount of the dry residue deposited on the stent after all volatile organic compounds (e.g., the solvent) have been removed. (c) the balance, a solvent mixture of acetone, the solvent mixture containing about 70 mass % of acetone and about 30 mass % of cyclohexanone. In a manner identical to the application of the primer layer, nineteen spray passes is performed, followed by baking the drug-polymer layer at about 50° C. for about 2 hours, to form the drug-polymer reservoir layer having a solids content between about 30 μg and 750 μg, for example, about 190 μg, and a drug content of between about 10 μg and about 250 μg, for example, 50 μg. 1. A biocompatible polymer comprising fluorinated monomers and hydrophilic monomers. wherein the hydrophilic monomer is selected from the group consisting of vinyl monomers that bear a pyrrolidone group(s), carboxylic acid group(s), sulfonic acid group(s), sulfone group(s), amino group(s), alkoxy group(s), amide group(s), ester group(s), acetate group(s), poly(ethylene glycol) group(s), poly(propylene glycol) group(s), poly(tetramethylene glycol) group(s), poly(alkylene oxide) group(s), hydroxyl group(s), or a substituent that contains a charge or one of pyrrolidone group(s), carboxylic acid group(s), sulfone group(s), sulfonic acid group(s), amino group(s), alkoxy group(s), amide group(s), ester group(s), acetate group(s), poly(ethylene glycol) group(s), poly(propylene glycol) group(s), poly(tetramethylene glycol) group(s), poly(alkylene oxide) group(s), hydroxyl group(s), and combinations thereof. 3. 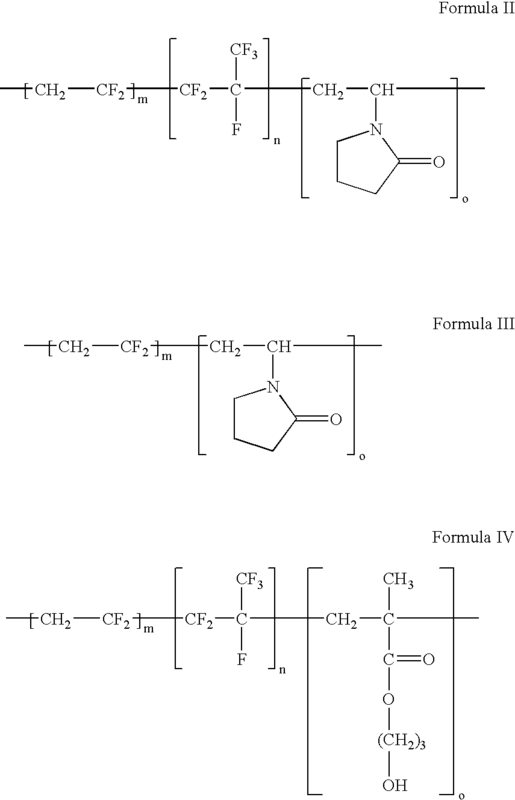 The biocompatible polymer of claim 2, wherein the flexibility monomer can be —CF2—CRF—, —CHF—CRF—, and —CF2—CRH—, or combinations thereof in which R is selected from the group consisting of trifluoromethyl, F, Cl, Br, I, short chain alkyl groups from C2 to C12, fluorinated short chain alkyl groups from C2 to C12, and combinations thereof. 4. The biocompatible polymer of claim 1, wherein the hydrophilicity monomer is selected from the group consisting of vinyl pyrrolidone, hydroxyethyl methacrylate, hydroxypropyl methacrylate, methyl vinyl ether, alkyl vinyl ether, vinyl alcohol, methacrylic acid, acrylic acid, acrylamide, N-alkyl acrylamide, hydroxypropylmethacrylamide, vinyl acetate, 2-sulfoethyl methacrylate, 3-sulfopropyl acrylate, 3-sulfopropyl methacrylate, PEG-methacrylate, 2-aminoethyl methacrylate hydrochloride, N-(3-aminopropyl)methacrylamide hydrochloride, 2-N-morpholinoethyl methacrylate, vinylbenzoic acid, vinyl sulfonic acid, styrene sulfonates, a monomer that bears a charge, and combinations thereof. 5. The biocompatible polymer of claim 2, wherein the hydrophilicity monomer is selected from the group consisting of vinyl pyrrolidone, hydroxyethyl methacrylate, hydroxypropyl methacrylate, methyl vinyl ether, alkyl vinyl ether, vinyl alcohol, methacrylic acid, acrylic acid, acrylamide, N-alkyl acrylamide, hydroxypropylmethacrylamide, vinyl acetate, 2-sulfoethyl methacrylate, 3-sulfopropyl acrylate, 3-sulfopropyl methacrylate, PEG-methacrylate, 2-aminoethyl methacrylate hydrochloride, N-(3-aminopropyl)methacrylamide hydrochloride, 2-N-morpholinoethyl methacrylate, vinylbenzoic acid, vinyl sulfonic acid, styrene sulfonates, a monomer that bears a charge, and combinations thereof. wherein the hydrophilic monomer is in the range from above 0 mole % to about 20 mole %. 8. A biocompatible polymer blend comprising a biocompatible polymer that comprises fluorinated monomers and at least one other biocompatible polymer. 9. The polymer blend of claim 8, wherein the other biocompatible polymer is a hydrophilic polymer. 10. The polymer blend of claim 8, wherein the biocompatible polymer is selected from the group consisting of poly(ester amide), polyhydroxyalkanoates (PHA), poly(3-hydroxyalkanoates), poly(4-hydroxyalknaotes), polymers and copolymers comprising a monomer selected from the group consisting of 3-hydroxypropanoate, 3-hydroxybutyrate, 3-hydroxyvalerate, 3-hydroxyhexanoate, 3-hydroxyheptanoate, 3-hydroxyoctanoate, 4-hydroxybutyrate, 4-hydroxyvalerate, 4-hydroxyhexanote, 4-hydroxyheptanoate, and 4-hydroxyoctanoate, poly polyesters, poly(D,L-lactide), poly(L-lactide), polyglycolide, poly(D,L-lactide-co-glycolide), poly(L-lactide-co-glycolide), polycaprolactone, poly(lactide-co-caprolactone), poly(glycolide-co-caprolactone), poly(dioxanone), poly(ortho esters), poly(anhydrides), poly(tyrosine carbonates) and derivatives thereof, poly(tyrosine ester) and derivatives thereof, poly(imino carbonates), poly(glycolic acid-co-trimethylene carbonate), polyphosphoester, polyphosphoester urethane, poly(amino acids), polycyanoacrylates, poly(trimethylene carbonate), poly(iminocarbonate), polyurethanes, polyphosphazenes, silicones, polyesters, polyolefins, polyisobutylene and ethylene-alphaolefin copolymers, acrylic polymers and copolymers, vinyl halide polymers and copolymers, such as polyvinyl chloride, polyvinyl ethers, polyvinyl methyl ether, polyvinylidene halides, poly(vinylidene fluoride-co-hexafluoropropylene), polyvinylidene chloride, polyacrylonitrile, polyvinyl ketones, polyvinyl aromatics, polystyrene, polyvinyl esters, polyvinyl acetate, copolymers of vinyl monomers with each other and olefins, ethylene-methyl methacrylate copolymers, acrylonitrile-styrene copolymers, ABS resins, ethylene-vinyl acetate copolymers, poly(n-butyl methacrylate), poly(sec-butyl methacrylate), poly(isobutyl methacrylate), poly(tert-butyl methacrylate), poly(n-propyl methacrylate), poly(isopropyl methacrylate), poly(ethyl methacrylate), poly(methyl methacrylate), polyamides, Nylon 66 and polycaprolactam, alkyd resins, polycarbonates, polyoxymethylenes, polyimides, polyethers, poly(glyceryl sebacate), poly(propylene fumarate), epoxy resins, polyurethanes, rayon, rayon-triacetate, cellulose acetate, cellulose butyrate, cellulose acetate butyrate, cellophane, cellulose nitrate, cellulose propionate, cellulose ethers, carboxymethyl cellulose, polyethers, poly(ether-esters), poly(ethylene oxide-co-lactic acid) (PEO/PLA), polyalkylene oxides, poly(propylene oxide), polyalkylene oxalates, polyphosphazenes, phosphoryl choline, poly(aspirin), polymers and co-polymers of hydroxyl bearing monomers, HEMA, hydroxypropyl methacrylate (HPMA), hydroxypropylmethacrylamide, PEG acrylate (PEGA), PEG methacrylate, 2-methacryloyloxyethylphosphorylcholine (MPC) and n-vinyl pyrrolidone (VP), carboxylic acid bearing monomers, methacrylic acid (MA), acrylic acid (AA), alkoxymethacrylate, alkoxyacrylate, and 3-trimethylsilylpropyl methacrylate (TMSPMA), poly(styrene-isoprene-styrene)-PEG (SIS-PEG), polystyrene-PEG, polyisobutylene-PEG, polycaprolactone-PEG (PCL-PEG), PLA-PEG, poly(methyl methacrylate)-PEG (PMMA-PEG), polydimethylsiloxane-co-PEG (PDMS-PEG), PLURONIC™ surfactants (polypropylene oxide-co-polyethylene glycol), poly(tetramethylene glycol), hydroxy functional poly(vinyl pyrrolidone), glycosamino glycan (GAG), GAG derivatives, silicones, and combinations thereof. 11. A polymer blend, comprising the polymer of fluorinated monomers as defined according to claim 1, a biocompatible polymer, and optionally a biobeneficial material. 12. A polymer blend, comprising the polymer of fluorinated monomers as defined according to claim 2, a biocompatible polymer, and optionally a biobeneficial material. 13. A polymer blend, comprising the polymer of fluorinated monomers as defined according to claim 6, a biocompatible polymer, and optionally a biobeneficial material. 14. An implantable device having a biocompatible coating thereon, wherein the biocompatible coating comprises the biocompatible polymer of claim 1. 15. An implantable device having a biocompatible coating thereon, wherein the biocompatible coating comprises the biocompatible polymer of claim 2. 16. An implantable device having a biocompatible coating thereon, wherein the biocompatible coating comprises the biocompatible polymer of claim 3. 17. An implantable device having a biocompatible coating thereon, wherein the biocompatible coating comprises the biocompatible polymer of claim 4. 18. An implantable device having a biocompatible coating thereon, wherein the biocompatible coating comprises the biocompatible polymer of claim 5. 19. An implantable device having a biocompatible coating thereon, wherein the biocompatible coating comprises the biocompatible polymer of claim 6. 20. An implantable device having a biocompatible coating thereon, wherein the biocompatible coating comprises the biocompatible polymer of claim 7. 21. An implantable device having a biocompatible coating thereon, wherein the biocompatible coating comprises the polymer blend of claim 8. 22. An implantable device having a biocompatible coating thereon, wherein the biocompatible coating comprises the polymer blend of claim 9. 23. An implantable device having a biocompatible coating thereon, wherein the biocompatible coating comprises the polymer blend of claim 10. 24. The implantable device of claim 14 which is a drug-delivery stent, wherein the coating further comprises a bioactive agent. 25. The implantable device of claim 15 which is a drug-delivery stent, wherein the coating further comprises a bioactive agent. 26. The drug-delivery stent of claim 24, wherein the bioactive agent is selected from the group consisting of paclitaxel, docetaxel, estradiol, nitric oxide donors, super oxide dismutases, super oxide dismutases mimics, 4-amino-2,2,6,6-tetramethylpiperidine-1-oxyl(4-amino-TEMPO), tacrolimus, dexamethasone, rapamycin, rapamycin derivatives, 40-O-(2-hydroxy)ethyl-rapamycin (everolimus), 40-O-(3-hydroxy)propyl-rapamycin, 40-O-[2-(2-hydroxy)ethoxy]ethyl-rapamycin, and 40-O-tetrazole-rapamycin, ABT-578, clobetasol, prodrugs thereof, co-drugs thereof, and a combination thereof. 27. The drug-delivery stent of claim 25, wherein the bioactive agent is selected from the group consisting of paclitaxel, docetaxel, estradiol, nitric oxide donors, super oxide dismutases, super oxide dismutases mimics, 4-amino-2,2,6,6-tetramethylpiperidine-1-oxyl(4-amino-TEMPO), tacrolimus, dexamethasone, rapamycin, rapamycin derivatives, 40-O-(2-hydroxy)ethyl-rapamycin (everolimus), 40-O-(3-hydroxy)propyl-rapamycin, 40-O-[2-(2-hydroxy)ethoxy]ethyl-rapamycin, and 40-O-tetrazole-rapamycin, ABT-578, clobetasol, prodrugs thereof, co-drugs thereof, and a combination thereof. 28. A method of treating a disorder in a patient comprising implanting in the patient the drug-delivery stent of claim 24, wherein the disorder is selected from the group consisting of atherosclerosis, thrombosis, restenosis, hemorrhage, vascular dissection or perforation, vascular aneurysm, vulnerable plaque, chronic total occlusion, patent foramen ovale, claudication, anastomotic proliferation for vein and artificial grafts, bile duct obstruction, ureter obstruction, tumor obstruction, and combinations thereof.